The Patient Portal's Practice Site allows the practice to send and receive secure messages from patients and providers. It also provides administrative tools for the patient site. This page provides details on the different sections of the practice site. Inbox: This houses all incoming direct messages. Archive: Provides a location to keep old messages that should not be deleted. Trash: Provides a temporary location for deleted messages. 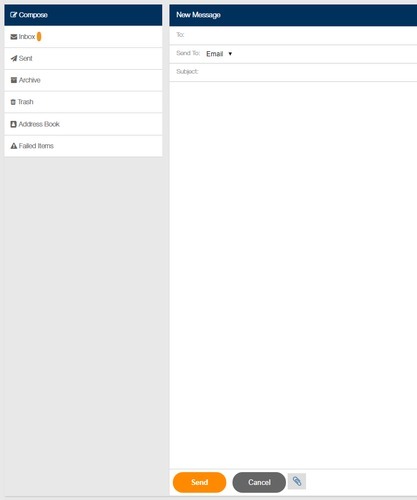 Address Book: Allows the user to create a list of providers or practices they send messages to. Failed Items: Provides a list of items that failed to send. From any area in the Mailbox, the user can click the Compose button to create a new message. Once you have clicked Compose, the new message section will replace the current information on the right-hand side of the screen. You can select the message recipient(s), add a subject for the message, compose the body of the message and attach documents if desired. Once the message is ready to send, click the Send button at the bottom of the window to send the message. The Secure Message inbox contains all of the patient secure messages sent through the portal. This also allows the practice to send messages directly to the patient's portal account. From any area in the Secure Message inbox, the user can click the Compose button to create a new message. Once you have clicked Compose, the new message section will replace the current information on the right-hand side of the screen. You can select the patient, a URL for the message, add a subject for the message and compose the body of the message. Once the message is ready to send, click the Send button at the bottom of the window to send the message. The Practice Settings screen contains the practice and user settings for the patient portal. At the top of the screen are two tabs, Practice Setup and User Setting. Practice Setup contains the practice address, hours of operation, logos, and a map showing the location of the practice. To adjust these settings first click the Edit button at the bottom of the page. To set the hours of operation, check off all days which you wish to set and select the time frame. If you wish to do different times for different days, only check off those which will have the same time. Once you have selected the desired days and time, click the Add button to add this to the practice schedule. Practice logos can be uploaded using the Upload buttons in the logo and login page image tiles. User Settings includes the time out and warning message for the web page. These will determine when the portal will log out automatically and when the user will receive an inactive warning for the site logging out. Forms allows the practice to share PDF documents with patients through the patient portal. To upload a document, click the Upload button on the forms screen and select the document you would like to upload from your local computer.